a) Readings from sacred scripture shall be arranged so that the riches of God’s word may be easily accessible in more abundant measure. The Vatican II theme: accessibility and abundance. Non-Scripture readings are valued in the tradition of the Hours. Modern rationalism, eh? With the ancient saints, history doesn’t even enter into the picture because the early accounts were not literal in the same way modern news accounts and written history would be. Personally, I would have no problem with the more apocryphal accounts, assuming that the really excessive aspects were minimized and the spiritual value was clear. As for the martyrology, this is merely the fulfilling of what Trent in a sense could be said to have kicked off, when you realize that that Bollandist project goes back to the late 1500s. At that time, our ability to scrub the martyrology was hampered by lack of research and the sheer volume of the amount of research needed. It tooks centuries (we have lots of saints covering a lot of time and space, and even more stories (and stories about those stories) about them, after all). 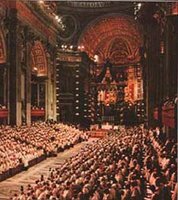 Vatican II was basically say: OK, we’re ready enough for now.